The scenery that flashed past our windows as we headed toward Bunbury was lovely, but it seemed strange, too. After a month of red earth and cloudless blue skies, the green and gray that surrounded me now actually required a little mental adjusting. Could the rust-hued wilderness really only be three days in the past? However, I was hardly ungrateful for my new surroundings, just startled by the dramatic change—and perhaps worrying that “real” adventure was behind me. And I was missing the people with whom I’d shared adventures for the last two weeks. But the flowers delighted, and the rolling, tree-covered hills were soothingly beautiful. I had read about Banksias, seen pictures of tiny marsupials lapping nectar from Banksias, but it was on the wildflower tour that I first came in contact with this odd, fascinating, iconic Aussie flower in the wild. 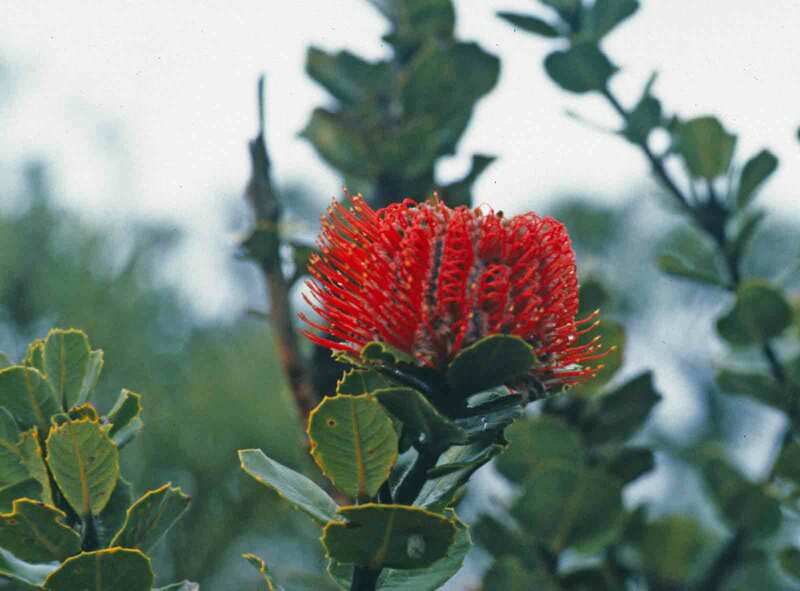 There are 76 species of Banksia, all but one of which are indigenous to Australia—and most of those species (60 of the 76) are found in the corner of Western Australia through which I was traveling. Banksias are wonderful plants with tough, spiny evergreen leaves and pillar-like flower spikes that are made up of hundreds, and sometimes thousands, of tiny flowers grouped together in pairs. The flowers’ colors range from yellow to red, but include rust, brown, orange, gold, and even purply gray. 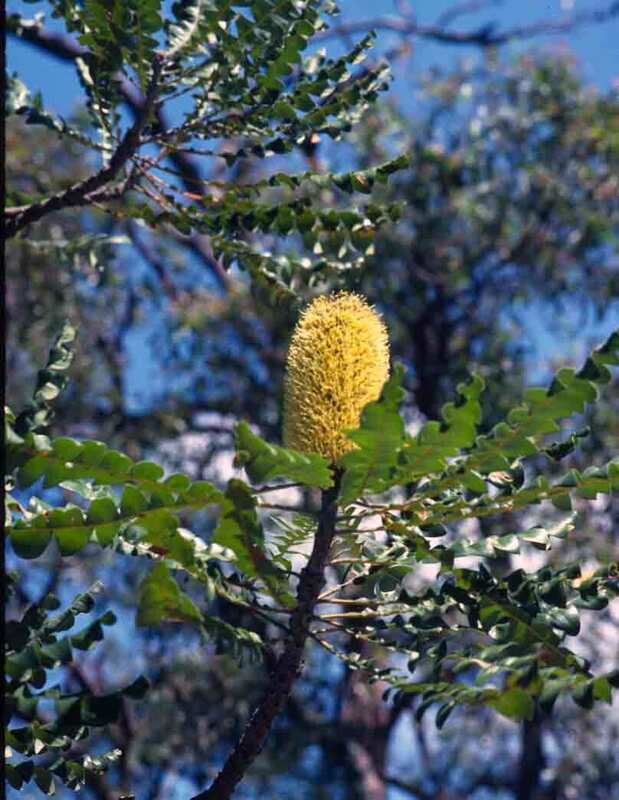 The genus Banksia was named for botanist Joseph Banks, the first European to collect specimens of the plants. That was in 1770, and Banks was one of the scientists traveling with Captain James Cook on the voyage that first charted Australia’s east coast. Banks was only 25 when he set off with Captain Cook on what would be one of the most important voyages of discovery in history, a voyage that would last from 1768 into 1771. However, he was already an experienced and respected scientist, and this was not his first voyage. Banks was wealthy, and he poured a great deal of his personal fortune into outfitting Cook’s voyage. He also rounded up a formidable group of scientists and artists to help him with the task of keeping track of everything. While the primary purpose of the voyage was to observe the transit of Venus across the sun (James Cook having been selected for the mission because of his skill in astronomy), it was the voyage’s secondary purpose that motivated Banks’s participation. They were to explore everything they could in the South Pacific, and record everything they learned about the plants and animals. Banks excelled at this task. Even while under sail, he was busy recording everything he saw: birds, fish, porpoises, and even seaweed hauled onto the ship. Everywhere the ship made landfall—South America, Tahiti, New Zealand—Banks would write about the birds and animals and collect every plant species he could possibly get on the ship, while others drew or painted his discoveries. But it was in Australia that Banks would make some of his most famous discoveries. Nowhere else had they seen so many unfamiliar plants. The ship pulled into a bay on the coast of what is now New South Wales, and Banks and the other scientists traveling with him went ashore. In a relatively short amount of time, they had collected such huge numbers of specimens of plants never seen before by Europeans that Captain Cook decided to call the spot Botany Bay. In eight days, they amassed one of the greatest collections of plants ever made. When they at long last returned to England, the extent of Banks’s research and collecting was so great that his fame almost overshadowed Cook’s for a while—though only in scientific circles, not in naval ones. Sir Joseph Banks died in 1820, leaving his library and huge collections of specimens, engravings, drawings, botanical paintings, and manuscripts to London’s Natural History Museum, where many of them may still be viewed today. Amid the floral discoveries on the second day of the wildflower tour, while everything I saw delighted me, the one find that pleased me most was running across an area that was almost exploding with kangaroo paws. Clouds of the flowers crowded among trees and sprawled across open spaces. Indigenous to this corner of the continent, the kangaroo paw is the state flower of Western Australia, so I was glad to see it for the sake of its importance to the region through which I was traveling. 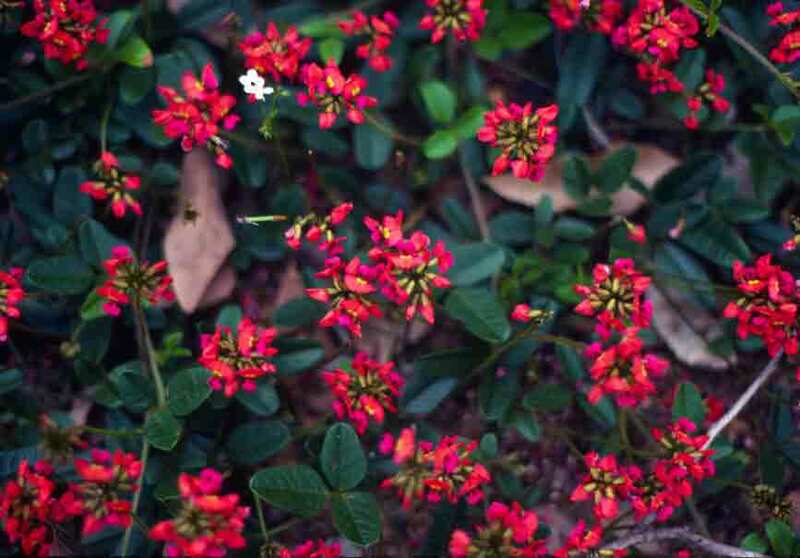 But the other reason I was happy to see it is that it seemed so perfectly Australian—it attracts birds, it reminds some of kangaroos, and best of all, to my mind, for a continent on the opposite side of the world, its colors are “upside down”—it has red stems and green flowers. 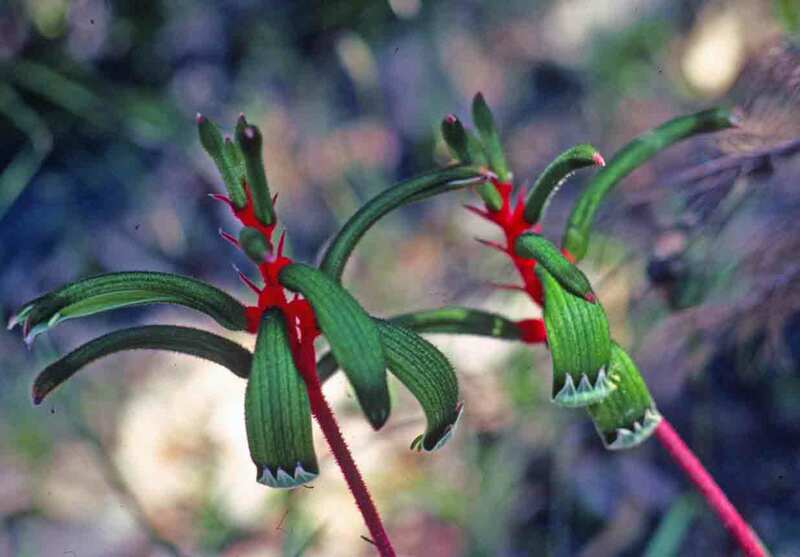 There are actually species of kangaroo paw with other colors, such as the black and gold ones I saw later that same day, but it is the red and green variety that is WA’s state flower. Of course, we saw hundreds more flowers as we continued our rambling, but we’ll save those for another post. Among the few buildings that remain from the early days of Australind is St Nicholas Church, which was built in 1848. Originally built as a workman’s cottage, St. Nicolas Church is said to be the smallest church in Australia. Services are still held in this cozy little building. Nearby is Henton Cottage. 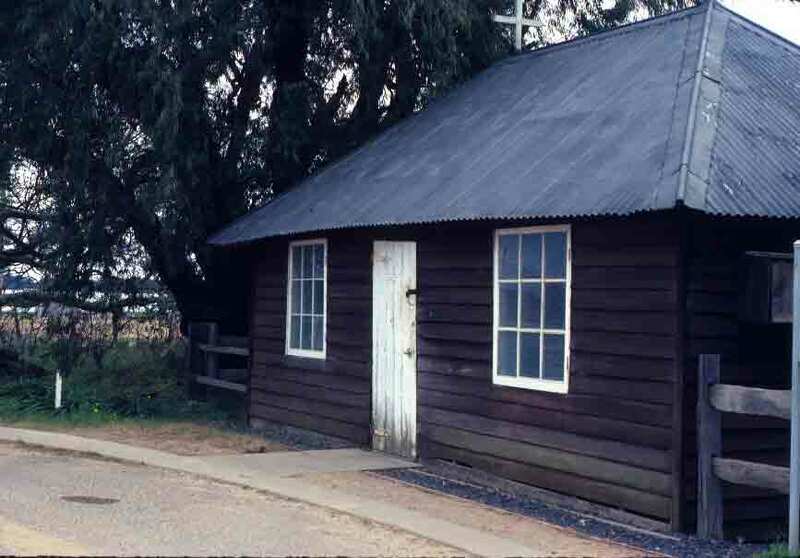 Home to the town’s Tourist Information Center, the cottage, built in 1841, is part of a group of buildings that preserve Australind’s early history. After New Norcia, we headed for Perth, arriving in the early evening. We had a brief reintroduction to coping with civilization, but then I was off again. Saying farewell to Jo and Nikki was hard, but I had booked a wildflower tour for early the next morning. So next day, I was with a completely new group, plunging off into the wilderness once again, but this time, into a gentler, greener wilderness. The southwest of Western Australia is considered to have one of the most dazzling spring floral displays in the world, with approximately 8,000 species of wildflower running riot over the landscape. And I was soon in the midst of this floral wonderland. Flowers were not the only thing we would see, but we saw them in astonishing variety and almost overwhelming profusion. It was glorious. 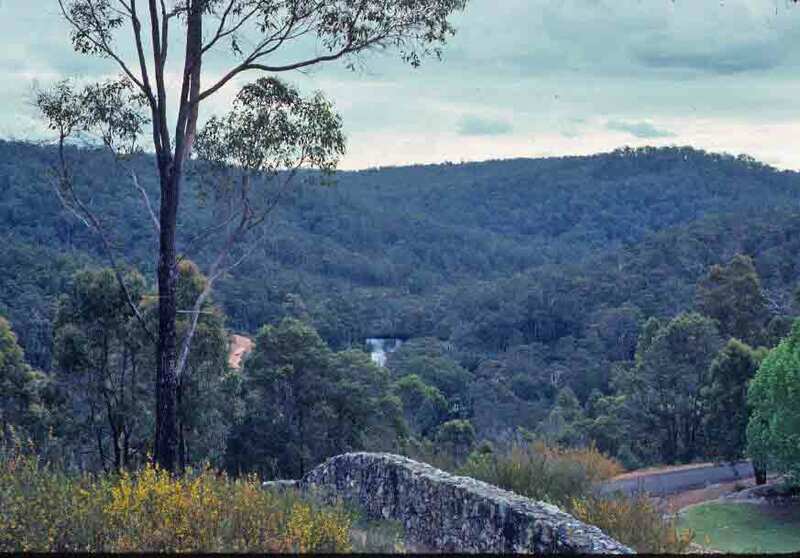 Within a few hours of leaving Perth, we were surrounded by fields, forests, and wildflowers. It was time for our first photo stop. Fortunately, in addition to having a botanist traveling with us, many of those in my group were very knowledgeable, and whoever was closest to me eagerly pointed out anything they discovered that they thought I might miss. We photographed dozens of flowers at that first stop, but I’ll offer just two today. 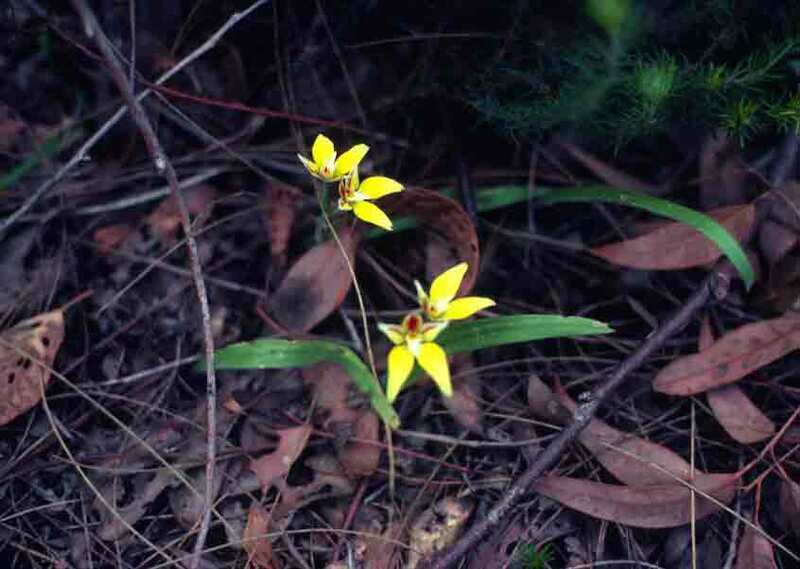 The yellow cowslip orchid and the coral vine.